Before technology made it possible for women to simply take a little stick into the bathroom with them to find out if they were pregnant, how did women know they were expecting a baby? Surely they did not wait until they were obviously showing or in labor to know they were pregnant. In fact, they did not. They may not have had the kind of access women today have to at-home pregnancy tests or even blood tests at the doctor's office, but they did have the ability to test for pregnancy with homemade pregnancy tests. It is important for you to know that while these homemade pregnancy tests are not dangerous to you, they are also not scientifically proven to provide accurate results. Even if the results of your homemade pregnancy test show a positive result, it is important that you take an at-home pregnancy test to verify your pregnancy before calling your doctor to schedule your first prenatal appointment. Additionally, it is also important to handle the contents of some of these tests with care, especially the homemade bleach test. If you are pregnant, you do not want to inhale the fumes from the bleach, and if you spill a little bleach on your clothing or furniture, it could ruin both. One simple way to make a homemade pregnancy test is to buy a bottle of vinegar. By pouring your urine into a small cup of vinegar, you are supposed to be able to predict pregnancy. If you are pregnant, the color of the urine and vinegar combination will change. Additionally, there could be some fizzle when you pour the urine into the vinegar. There is no scientific evidence to support this kind of homemade test. Additionally, there is no research available to indicate how much urine or how much vinegar to use to make this test work. The ratios are unknown, which means you might not get an accurate result if you were to use too much vinegar and not enough urine, or vice versa. It is unknown why this test is believed to work. The waiting time between adding your urine to the vinegar and the color change in the concoction is also unknown. 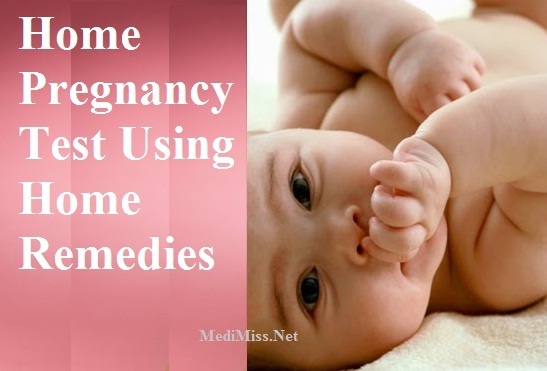 Additionally, it is unknown exactly when you can use this homemade test to predict pregnancy. Some at-home pregnancy tests work as many as six days before your missed period, but there is no indication that this homemade test has the same level of sensitivity. However, it might be better to wait until at least the day of your missed period to take this homemade test for pregnancy. You might have pine sol at home. You might use it to clean your kitchen, bathrooms, and floors. Many people do. You can also use it to test for pregnancy. The way you do this is by adding fresh urine to a bottle of pine sol. If the solution changes color, this is supposed to indicate pregnancy. While this homemade pregnancy test is one that many women swear by, there is no scientific research to show that it is accurate enough to use to predict pregnancy. For one, there is no indication over how long you should wait for the solution to change color. For example, when you take an at-home pregnancy test, you wait the number of minutes listed on the instructions to see your results. There is no time frame for this homemade test. There is also no indication over what kind of color change to look for in the solution. The only piece of advice offered when making this homemade test is that you use natural pine sol void of any additives or fragrances. To test for pregnancy using bleach, pour it into a cup with fresh urine. If the solution turns fizzy, frothy, or starts bubbling, it indicates pregnancy. If the solution does nothing, you are not pregnant. Much like other homemade tests, there is no instruction as to how much bleach to add to how much urine or how much time to wait for the results. There is, however, a precautionary warning when using this type of test. When mixed with urine, bleach produces harmful gasses that could be harmful to you and your potential baby if inhaled. Be sure that when you perform this type of homemade test, you head outside to do it so that you limit your chances of inhaling the dangerous fumes. To test for pregnancy using toothpaste, make sure that your toothpaste is white in color. Put the toothpaste on a plate or in a cup and pour urine over it. If you are pregnant, it is alleged that the toothpaste will change color. There is no advice on how much urine or how much toothpaste to use. There is also no indication that you should use a specific type of white toothpaste, just that you should use toothpaste white in color. Additionally, it is unknown how much time you should wait to see if your toothpaste changes color to indicate pregnancy. This test involves collecting the stems and leaves from several dandelions. You will then saturate the stems and leaves of each dandelion with urine and let it sit for a while. There is no indication of how much time you should allow the dandelion stems and leaves to sit before you check to see if the results indicate pregnancy or not. You will look for red blisters on the leaves and stem. If you see them, it means you are pregnant. If you do not see blisters, you are not pregnant. While it might be fun to take a homemade pregnancy test, it's not necessarily the best way to learn whether or not you are pregnant. Aside from the potential dangers of the bleach test, they are harmless. However, you shouldn't rely solely on the results of a homemade pregnancy test to determine whether or not you are pregnant.